Blogs are "a flutter" with comments on the iPhone--what people love about it--and what needs improved. I like the iPhone. AT&T's coverage could improve, for one. 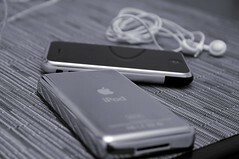 But with the iPod itself, here are a few observations of my own, which I haven't seen mentioned elsewhere. * I want to be able to switch between camera and photos without having to go "back home" * I want to use my iPhone like I currently use iTunes in my listening salon (i.e., stream content to my AirportExpress, or stream the upstairs server's content to AirportExpress). Being able to sit down, and pull up tracks from my pocket without a computer in sight, would be awesome. Technically, I think it would be possible (WiFi and music are there), so I think it will only be a matter of time.